Location, location, location. Three small words that can transform your property investment decision, says Belvoir. 1. Only decide on where you want to invest after thorough research. 2. Do not make a decision based on the look of the property alone. Just because it appeals to you, it will not necessarily be a good rental investment. 3. 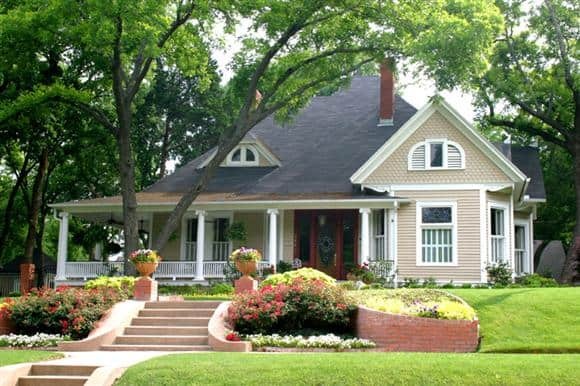 Providing tenants with a quality, well-maintained property for them to call home carries responsibilities. Only work with a local agent that you have checked out, trust and who has gained all the relevant professional industry accreditations. 4. Remember that big is not always best. A one or two-bedroom unfurnished apartment can often yield a better return than larger, four-bedroom furnished houses. It’s all down to location and the type of tenant you are targeting. 5. Overly high “yields” – or returns on an investment – can sometimes indicate hidden issues and may not necessarily lead to a good investment. 6. Beware of “buying cheap and paying dear”. If a property is located in a low-quality area it can increasingly become run down – attracting the wrong type of tenant and achieving poor long-term capital growth. According to a new market research report “Smart Meters Market by Type (Smart Electric Meters, Smart Water Meters, Smart Gas Meters), by End User (Industrial & Commercial and Residential), & Region (Americas, Asia-Pacific, Europe & RoW) – Trends and Forecast to 2019”, defines and segments the global smart meters market with an analysis and forecast of the market size. The smart meters market is estimated to grow from an expected $11.1 billion in 2014 to $18.2 billion by 2019, at a CAGR of 10.2% from 2014 to 2019. The implementation of smart meters will be advantageous for governments trying to achieve the objectives of emission reductions, security of energy supply, reducing carbon footprint of the country, and providing quality service to the end-user. Governments wants to accentuate the installation of smart meters as they foresee better management and efficient usage of energy, which will subsequently foster competition. For instance, some countries in Europe such as Italy, Sweden, and France have opted for rapid deployment of the technology, owing to the European Union directives for energy end-use efficiency by 2020. This research study involves extensive usage of secondary sources, directories, and databases (such as Hoovers, Bloomberg, Businessweek, Factiva, and OneSource) to identify and collect information useful for this technical, market-oriented, and commercial aspects of smart meters. The below explain the research methodology. The report caters to smart meter manufacturers, dealers, and suppliers, raw material providers, consulting companies in the energy and power sector, government and research organizations, government utility providers, private utility providers, private customers, network operators, metering companies, smart grid players, venture capital firms, and investment banks. Market share analysis, by revenue, of the top companies is also included in the report. The scope accordingly aids market participants to identify high growth markets and help managing key investment decisions. For this report, major players in the smart meters market have been identified via various primary and secondary sources, which include annual reports of top market players, interviews with key opinion leaders such as CEOs, directors, and marketing people. It’s been said that nothing is more certain than death and taxes. That may be so, but another certainty in life that needs to be added to that short list is “change”. No, I’m not talking about the money you get back when buying an item for $7.99 and paying with a ten dollar bill. Specifically I’m referring to the ever-changing variables in the housing and mortgage markets. The big, 800 ton “Blue Whale” in the topic tank today is the demographic phenomenon of our lifetime. Those of us who were born between 1946 and 1964 are rapidly filling the ranks of senior citizens. This unacceptable reality will be compounded by the fact that nearly 20 million seniors are paying over 30% of their income for housing, and nearly 10 million households pay more than 50%! So, like the ancient Chinese symbol for the word “crisis”, there are two sides to this housing trend. There’s the challenge side which is self-evident, but there’s also an enormous opportunity. For example, according to AARP and the above mentioned report, only 1% of the entire housing inventory in the U.S. has the recommended design features needed by older people. These features include the most obvious one like step-free entries, countertops at varying heights, wide doorways, faucets with levers and a shower with no curb and a handheld adjustable shower head. The bottom line is that there is a lack of housing with the basic features that accommodate and support the aging. Plus, there’s a drastic dearth of affordable housing and services to take care of residents of all ages, incomes and abilities. As property managers with a wide range of experience, clients and connections, we can see the needs and do something about this crisis. The most logical first step is to discuss this trend with our clients. Show them this article and use it as a talking point for planning purposes. Then speak to local leaders in government, the rental housing industry and non-profits like Habitat for Humanity. Recently I heard of a property manager who found a big church building for sale. After doing her due diligence she led a team of investors and concerned citizens who purchased it for a reasonable price. Then with financing from various government-sponsored and private organization, they rehabbed the building into 12 senior residences ideally suited for senior citizens, especially those with disabilities. An additional incentive is that interest rates for housing loans are low and may possibly be going lower. Last week, U.S. 30-year mortgage rates finished the week at about 3.6%. That’s almost as low as mortgage rates fell in late 2012, when they dipped to 3.3%. With international investors expected to buy more U.S. treasury bonds, especially the benchmark 10 year bond that currently yields less than 2%, mortgage rates may drop even more. Here’s the “perfect storm”; a generational housing shortage at the same time that the cost of borrowing money to build has plunged to record lows. Find out if your area needs more affordable rental housing for seniors. Then start conversations on how to participate in the profitable solution to this epic trend. 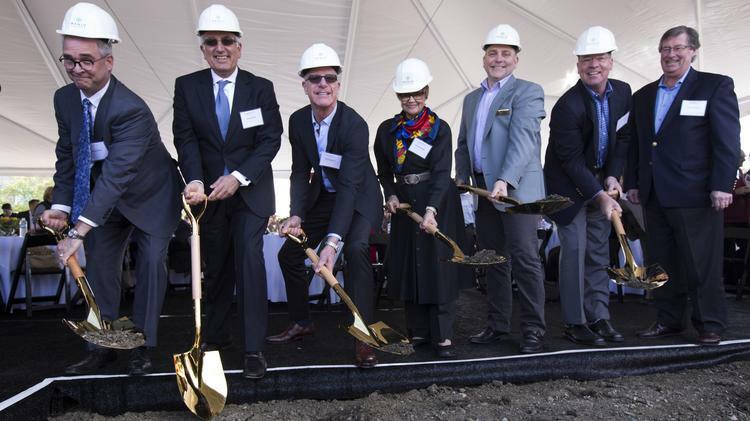 Forgive David Bohannon for taking a smidge longer than his allotted five minutes at the podium Wednesday during the ceremonial groundbreaking for Menlo Gateway, his company’s office and hotel project down the road from theFacebook campus in Menlo Park. “I’m taking way too long, but what can I say, I’m going to continue,” Bohannon told a crowd gathered under a tent with earth moving equipment in the background. And why shouldn’t he? The project has been in the works for a decade, enduring endless community meetings, city council and planning commission debates, a citywide referendum (it passed overwhelmingly) and — more recently — a brutal recession that chilled demand for high-end hotel development. Now Bohannon, president and CEO of the David D. Bohannon Organization, could use a moment to take it all in and reflect. The hotel deal was crucial for getting the larger Menlo Gateway project off the ground because it was baked into city requirements for building any of the office space. With the hotel now under construction, Bohannon is also starting work on the first phase of the office campus — an eight-story, 205,000-square-foot tower at the corner of Marsh Road and Highway 101. Both elements are slated for completion by the end of 2017; another 500,000 square feet of office, in two buildings, will come later. It’s a momentous milestone for the family-run Bohannon company, which also owns Hillsdale Shopping Center in San Mateo, one of the few family-owned shopping malls in the country. The 2015 Top 10 States list honors transformative efforts at the state level to create healthier, more energy- and water-efficient places to live, learn, work and play. In 2015 alone, 1,633 projects were certified in the United States—equivalent to an incredible 275 million square feet. In this series, we spotlight the standout LEED-certified projects that contributed to the 2015 Top 10 rankings. Join us in celebrating some of the best examples of green building design, construction and operation. The Mitchell Park Library and Community Center (Mitchell Park Center) is 56,332 square feet of new construction in Palo Alto, Calif. Opened to the public in December 2014, the project was awarded LEED Platinum for New Construction in April 2015. 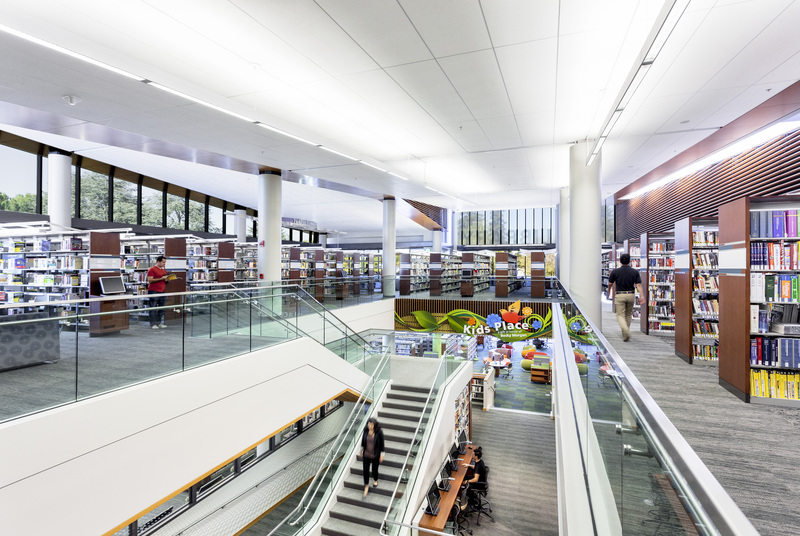 The 40,000-square-foot library is the newest and largest of six libraries in the Palo Alto City Library (PACL) system, built to accommodate a build-out collection of up to 140,000 print volumes. The building contains lounge and work seats, group study rooms, technology seats and dedicated children and teen spaces. The library also shares access to the 16,000-square-foot community center wing with classrooms, a large multipurpose room, activity space, early childhood recreation space and a café. The Mitchell Park Center strives to educate the community about strategies to conserve resources, protect ecosystems and enhance the human experience while incorporating these practices into its daily operations. The new joint-use facility replaces the previous library and community center buildings on the same site at the southeast edge of Mitchell Park. It more than triples the space of its predecessors, but the project’s footprint does not encroach on the park. Parking is shared with other recreational uses, including copious bike parking and excellent transit access, which allows for a significant reduction in dedicated library parking. The project is designed to reduce potable water use by 44 percent today, and up to 90 percent by 2020 when the municipal reclaimed water system is extended to the site. One hundred percent of precipitation is managed onsite through extensive pervious paving, infiltration basins and green roofs that reduce the overall quantity of stormwater discharge by 85 percent. Mitchell Park Center is designed to outperform California Title 24 energy code requirements (California’s building energy efficiency standards) by 42 percent. Strategies to reduce energy use and carbon emissions include night sky radiant cooling, roof-mounted photovoltaic panels, mixed-mode ventilation, a solar thermal system, a condensate capture system and underfloor air distribution. Additionally, onsite renewable energy strategies are designed to generate approximately 20 percent of annual building energy use. California maintained its No. 7 rank in 2015. As the most populous state in the nation, it’s no surprise that the state certified the most amount of LEED space that year, with 618 projects representing 87 million square feet. San Francisco and Los Angeles both rank in the top 10 U.S. cities boasting the most amount of LEED-certified space—about 13.5 million and 12.2 million square feet, respectively. Incidentally, California cities also make up one-fourth of the top 20 U.S. cities with the most amount of LEED space. Between 2015 and 2018, green building is projected to add $91.22 billion to California’s GDP, as well as over a million jobs and $60.59 billion in labor earnings, according to USGBC’s Green Economic Impact Study, conducted by Booz Allen Hamilton. The study also anticipates that LEED alone will account for $58.4 billion of the state’s GDP growth, with 668,000 jobs and $39.15 billion in labor earnings, as well as $2.1 billion in tax revenue. The LEED Platinum Downey Energy Resource Center, a showcase facility where customers can learn about energy efficiency, conservation and alternative fuel transportation. It is one of four projects in California to be certified LEED v4 in 2015. The LEED Gold L.A. Convention Center recertification, the largest convention center in the United States to be recertified LEED Gold for EB+OM and the location for the 2016 Greenbuild International Conference and Expo. People who own a home in a Condo or HOA are homeowners, but of a slightly different variety. They depend on a good property management company. While they pay a mortgage and enjoy many of the benefits of owning a home, they give up a bit of autonomy due to the nature of condo living. A board of directors makes community decisions, assisted by a property manager who may add significant value or be a less-knowledgeable asset. As in every industry, there are stellar property management companies and those that might not quite hit the mark. Since a property manager is so important in a condo community, it’s critical to make a good choice — or suffer the consequences. Communication. Owners will get easily frustrated if they can’t reach the property manager in a timely fashion. While some queries may not be time-sensitive, others are more immediate in nature. Be sure your property management company has a 24/7 call center and its number, as well as an email address for the community’s property manager, is provided to all owners. Responsiveness. Good communication will fall flat if it doesn’t result in timely responses. It’s one thing to be able to reach a property manager, and another to have that person jump on the matter at hand if necessary. Full service. While your community will be working with a specific property manager, it’s important for that person to have support from a team that includes experts in areas like engineering, training, HR and accounting. This will be especially important if your property manager is a novice; you want to be sure he or she has access to the knowledge base of someone who is more seasoned. Track record of excellence. Ask for references from any property management company you’re considering. Ideally, you want to speak with current clients from communities that are similar in size to yours as well as former clients, to learn why the relationship ended. You can tell a great deal about any company from listening to what its current and past clients say about it. Vendor relationships. Maintenance and landscaping are two of the greatest line items for most condo communities, so having a property management company that can negotiate discounts or lower rates due to its strong relationships with companies providing those services can be beneficial. You never want to eliminate the competitive bidding process, but a good property management company will be able to provide expertise in weighing cost versus quality. Transparency. Your property management company should operate as an open book. Since it will serve as a financial steward for your association, collecting monthly dues and any special assessments levied, it should have strong financial controls in place to eliminate fraud. Standard operating procedures. The best property management companies will have proven operational procedures, developed over years of experience, in areas such as preventive maintenance, contract audits and budgeting. If it worked at another community, it should work at yours, too. There’s usually no reason to reinvent the wheel, so to speak. The very best property management companies will have the knowledge and experience to help enhance the value of owners’ homes and the community’s lifestyle. In a nutshell, that’s what all condo owners want: stable or rising property values and a safe, comfortable place to call home. Not all rooftops ought to have a striking resemblance. The business sector has such a large number of choices, that you may need to reevaluate what you are proposing and consider one of these phenomenal option roofing materials. The list can go on, yet here we have the most well known roofing materials in the market.Not beyond any doubt if shingles or developed material are the best choice? Continue reading and discover what you can use on your construction project. An extremely famous choice among construction experts, are the asphalt shingles. Because of cheapness and simplicity of establishments, asphalt shingles can be utilized and install at ease. They are fabricated in a wide assortment of hues and work awesome on inclined rooftops, single homes and domestic applications. To find out more about this roofing stuff visit here. Built-Up roofing is the most famous roofing material utilized on low-slanted roofs.Made of a few layers of bitumen surfaces, built-up roofing is done by applying a total layer or covering as the top layer. This top layer ordinarily is tar, over which the rock is laid on top. Different sorts of developed rooftops are smooth Asphalt developed (Hot or Cold), and Ballasted Asphalt built-up. Latest built-up items join an inflexible protection layer as a major aspect of the roofing material, so look at it and figure out the amount of this can cost you. The surfacing and materials utilized on built-up material are wide to the point that everything relies on upon the undertaking and expenses of your project. This is a way that can produce a few reserve funds to you too. Sun powered shingles join the concept of a sun oriented board and roofing material, giving a remarkable mix to your material needs. Sun based board consolidates the advantages of sun based force vitality with the unwavering quality of conventional rooftop shingles. Sun powered board shingles likewise can be utilized as a sturdy roofing material giving the same security from nature as you would have from general shingles. Single-ply roofing is another concept that you can use for the material needs. There are two fundamental sorts of single-Ply roofing : Thermosets and Thermoplastics. They additionally display extraordinary adaptability and their impervious to UV radiation is better when looked at than different items. Two of the most normally utilized thermoplastic single-ply membranes are PVC andTPO, which are both plastic-based materials. The Standing Seam material boards offer the planner the capacity to outline or determine different span rooftop profiles. This kind of metal roofing is comprised of vertical boards with two creases for every board that stand us vertically. Clay tiles are sturdy and lightweight, making it perfect in specific rooftops as they will likewise convey some extra advantages to the working when all is said in done. Earth tiles offer better protecting properties when contrasted with other comparative materials, for example, artistic tiles.